There's a fantastic little market over the hill in Brockley which has become a bit of a habit of mine. 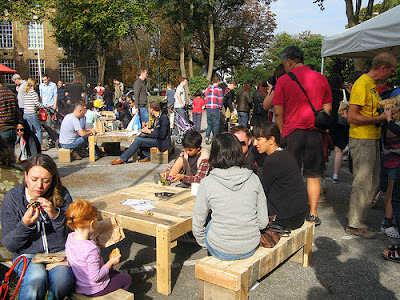 Every Saturday from 10am to 2pm you'll find a friendly bunch of local stallholders selling fruit and vegetables, speciality potatoes, flowers, free range chickens, game and a whole host of other meat, cheese, bread, cakes, handmade chocolates, fish, chilli plants, coffee and an ever changing array of food to eat on the go. I like the fact that there aren't twenty odd stalls all selling the same produce, that the stallholders always have time for a natter and that I barely notice that I've easily whiled away a couple of hours browsing this tiny gem. First stop is always Dark Fluid Coffee, the newest artisan roastery and mobile brewer on the block, to top up my caffeine levels. A short black americano to start my shopping with a warm tingly glow. You may have to queue for 5 or even 10 minutes or more before someone is free to take your order, but good coffee takes time to make. More often than not I trundle home laden with Kentish apples and pears from Perry Court Farm along with kale, leeks, cauliflowers and whatever else is in season to supplement my weekly Local Greens veg bag. I've been steering clear of the cheese recently (foolhardy I know...), but that hasn't stopped me gazing longingly at the Norbiton Cheese stall piled high with the likes of ticklemore, morbier, tunworth and epoisses. Last Saturday it was a lovely whole Mont d'Or that spoke to me - a tenner's worth of pure cheese heaven. 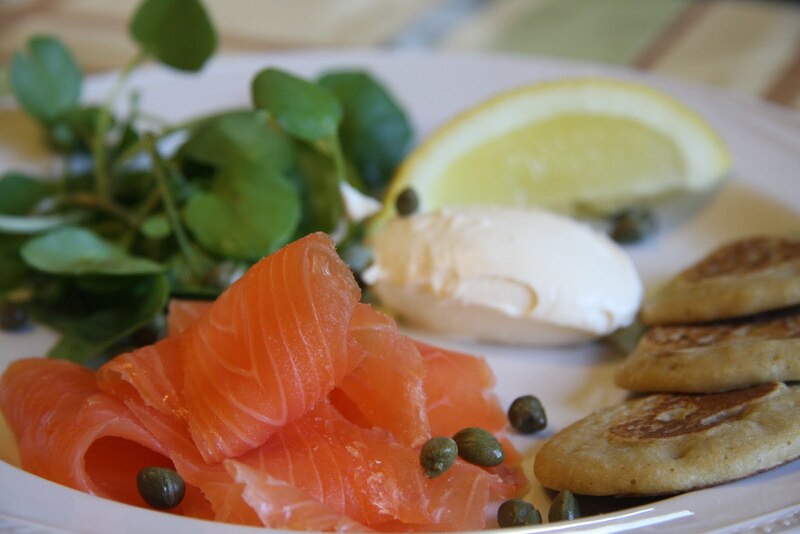 Now, if it's brunch or lunch on the hoof you're after, you'd have to go a long way to beat what Mike + Ollie have to offer. 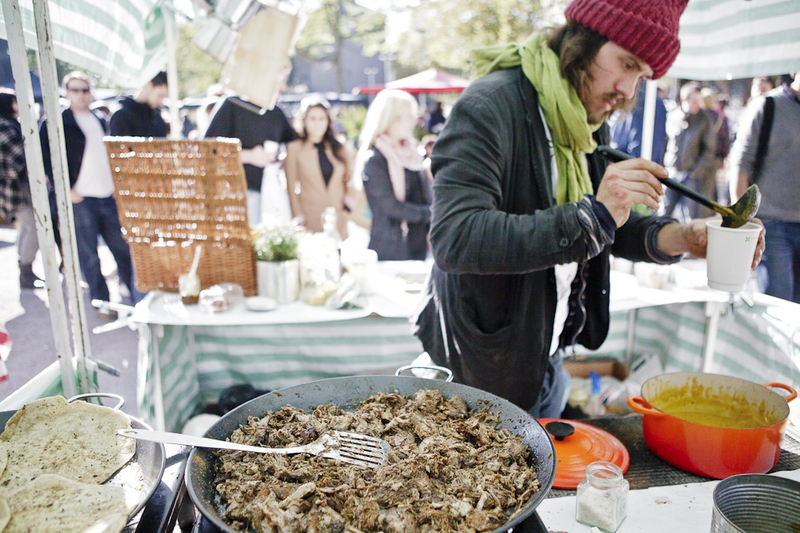 Mike and Ollie are two young chefs serving up affordable street food. But you won't find the regular fare of burgers, falafel, burritos and such like. Instead the ever changing menu reads like an encyclopedia of (often unusual) locally foraged foods that have been smoked, cured or preserved by Mike and Ollie themselves: fennel seeds foraged in Brockley, membrillo made from Crystal Palace quince, cobnuts, chestnuts picked in Greenwich, Brockley rosehip molasses... You get the picture. My homemade Lebanese flatbread was loaded with smoked aubergine, local fennel, babaganoosh, red cabbage slaw, Crystal Palace membrillo and a whole host of other herbs, spices and seeds too numerous to mention. At first sight you might be mistaken for thinking that it's just a bit of everything thrown together with no thought but you'd be a long way from the truth. From chatting to Mike, I have no doubt that every single ingredient has been well thought out and included for a reason. 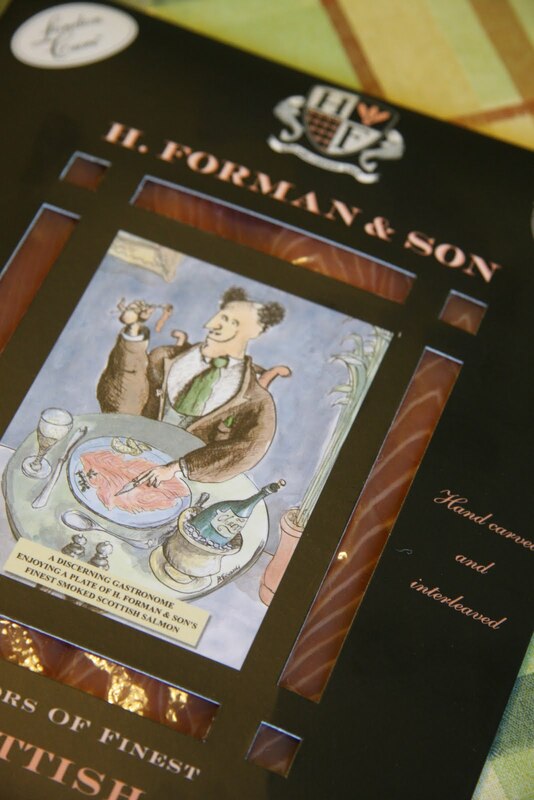 It's an incredibly tasty work of art. 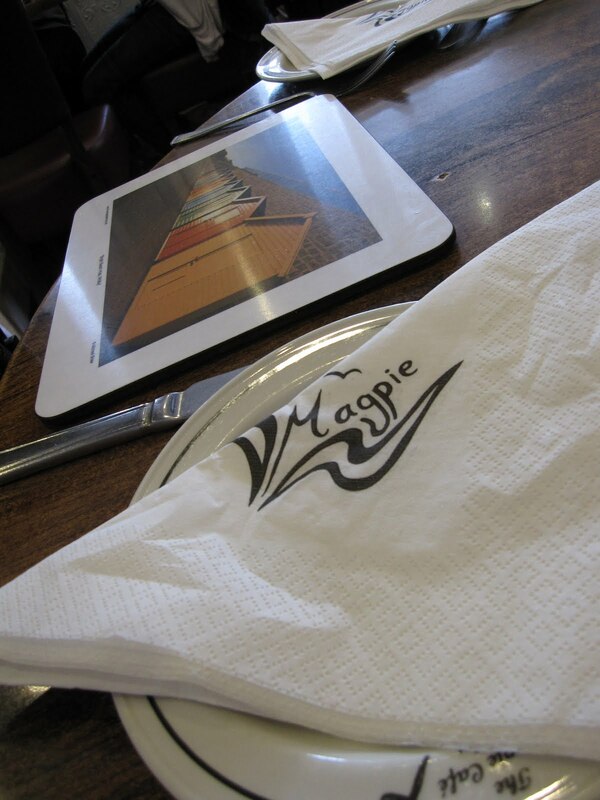 Each Saturday Mike cooks up a soup (£3.50), a meat main (£5.50) and a veg main (£5.50). Thank you to Toby Allen and Helen Graves for letting me use their photos of Mike at work and people enjoying the market in this post. Homemade mincemeat knocks the socks off anything you can buy in the shops. Fact. Luckily for me, in the past I've been gifted lovingly made jars of the stuff by friends and family. But this year as December approached the cupboards were bare. So I set off in search of a recipe. The sort of tried and tested one that can't go wrong (but that I would inevitably end up playing around with because I can't help myself). I thought Delia might hold the key, but melted suet? What's that all about? Not for me. Whenever I need what I'd refer to as a staple recipe (you know, things like simnel cake, shortbread, lemon curd...) to work from there is a handful of food blogs I tend to turn to. One of them is Gin and Crumpets written by fellow South East London dweller, Jassy. She writes recipes that work and ones that I want to cook. Armed with her wonderful recipe for Apple & Lemon Mincemeat (and some advice along the way) I set about creating my own vat of mincemeat. For that is what I made, a rather large quantity of mincemeat to see me through the festive season. I haven't put mine into jars as I reckon it won't be in existence any longer than a couple of weeks, so it's currently residing in a large tupperware in my cupboard. But you could of course sterilise some jars to store it in or to give away as gifts. Put the lemon and orange zest in a bowl, cover with boiling water and leave for half an hour. This will help extract any bitterness. I use a zester to remove long strips of zest, but if you haven't got one you can either grate the zest using a fine grater or pare the zest with a peeler (taking care not to take too much of the white pith which is bitter). Mix the dried fruit (sultanas, raisins and cranberries) in a large bowl and pick over to get rid of any stems . Drain the lemon and orange zest and chop. Stir the zest and all of the orange and lemon juice into the dried fruit. Peel, core and coarsely grate the apples. Add the grated apples, vegetable suet, sugar, brandy and spices to the dried fruit mixture and stir to mix thoroughly. The apples go brown pretty quickly when peeled, so I did a few at a time, adding them to the dried fruits as I went along so that the lemon juice prevent them from going brown. Leave to stand for a few hours, covered with a tea towel, returning to stir the mincemeat regularly. If you are just making the mincemeat to use over a couple of weeks then it will keep perfectly well sealed in a plastic container. If you want to store it in jars to keep it for longer, then fill sterilised jars, seal and store in a cool dark place. Huge thanks to Jassy of Gin and Crumpets for her mincemeat guidance. There's one thing I know for sure - pasta consumption in our house has rocketed since we started getting an organic veg bag again. 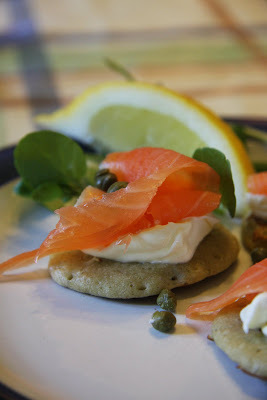 Picture this...it's 7.30pm on a week night, the baby has just gone to bed, the fridge is full of the random assortment of vegetables that you can only have when someone else is choosing your veg each week, your tummy is rumbling and you want to curl up on the sofa, sharpish. What you need is a hearty bowl of pasta that's ready in no time and leaves you feeling (relatively) virtuous. I think my love of the combination of kale and squash is probably inspired by Denis Cotter. He cooks the sort of good (vegetarian) food that I want to eat every day. Food that is a far cry from the apparently mandatory mushroom risotto or pasta served up as the meat-free option in many restaurants and pubs. You don't need to use crown prince squash - any squash will do - I just happen to like the rounded, buttery flavour of the crown prince. Butternut squash would be a more than adequate replacement. The same goes for the cavolo nero (black kale). Although cavolo nero tastes best, you could use the more widely available curly kale or any other dark green leafy vegetable. Peel and deseed the squash. Cut into 1 inch cubes. Season the squash with salt and pepper and toss in 1 tablespoon olive oil. Roast in a medium oven (approx 180 C depending on your oven) for approximately 20 minutes until tender and beginning to caramelise at the edges. You will need to check on the squash a couple of times and toss to ensure it roasts evenly. Discard the outer layer (or layers) of the leek and then slice in half lengthways. Slice the leek into thin semicircles and wash thoroughly. Wash the cavolo nero, discard any thick stalks and slice the leaves into strips about 1cm wide. Bring a large pan of salted water to the boil. Cook the pasta according to the packet instructions. Heat a wide based saute pan over a medium heat. Add 2 tablespoons of olive oil and then the leeks. Saute, stirring frequently, for 4 minutes and then add the cavolo nero. Continue to saute until the leeks and kale are tender. Lower the heat, add the red chilli and garlic and continue to saute for a couple of minutes. The pasta and squash should now be ready. Drain the pasta, reserving the cooking water. Add the squash, drained pasta and 3-4 tablespoons of the cooking water to the leeks and cavolo nero, then season generously. Serve with plenty grated cheese. 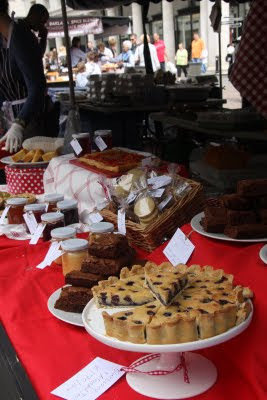 This Thursday, 11th August 2011, I will have a stall on the Covent Garden Real Food Market in aid of the East Africa Appeal. I would love it if you are in the area and could come down to support this worthy cause (and keep me company if only for a minute or two...). Please help me sell everything and raise as much money as I can by coming and buying your lunch and cake to see you and your colleagues through the afternoon! You can read all about my day as a market trader back in 2009 here. 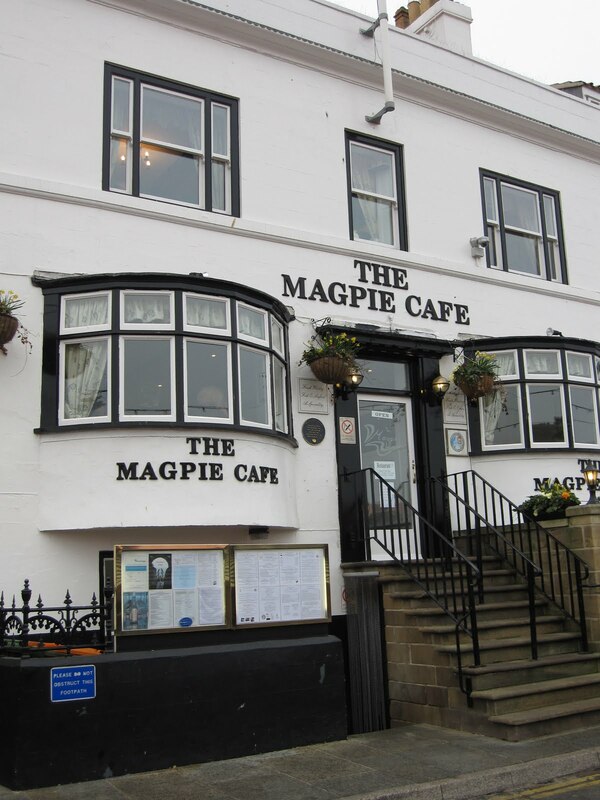 No trip to Whitby would be complete without sampling the fish and chips at The Magpie Cafe. But in all honesty I did wonder whether it was going to be another one of those places whose heyday has been a gone, yet is still pulling in the punters on its name alone. How wrong could I be? Very. And to think that we nearly missed out because of that queue that trailed out of the door, down the steps and along the harbour front at lunch time on a miserable drizzly day in March. The queue did put us off, but our stomachs got the better of us once the main lunch crowd had died down and we made a beeline to excape the rain. 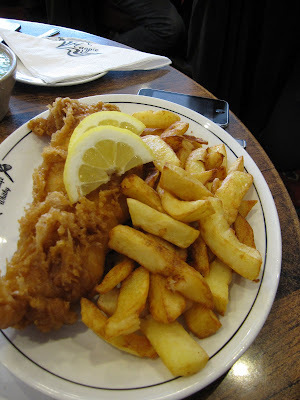 There really is very little to say, apart from the fact that these were, quite simply, the best fish and chips I have tasted for as long as I can remember. Haddock & Chips for me, Cod & Chips for Mr Ginger Gourmand and a whole heap of attention from the amazing waitresses for Baby GG. The service was second to none. Proper old school, no nonsense, friendly Yorkshire service. My only slight criticism would be aimed at the mushy peas. 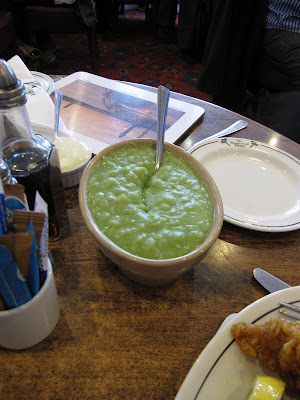 They were a great consistency, good sized portion (I LOVE mushy peas), but sadly not quite there flavour-wise. 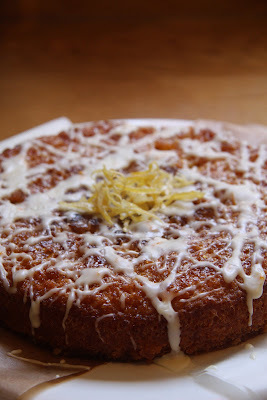 For my third cake this week I chose to make this deliciously sticky, sweet Tunisian Orange Cake which I (along with many others) fawned over when we tasted it at fellow blogger, Food Urchin's lamb in a pit extravaganza last summer. Sadly for poor Food Urchin, despite his best efforts to wow us all with his amazing-cooked-in-the-ground-for-10-hours lamb, it was his Dad's cake which stole the show. The original recipe doesn't have icing, but I wanted to 'posh it up' a bit on this occasion. It really isn't necessary and you could just serve it as it is or with a dollop of yogurt or fresh cream. 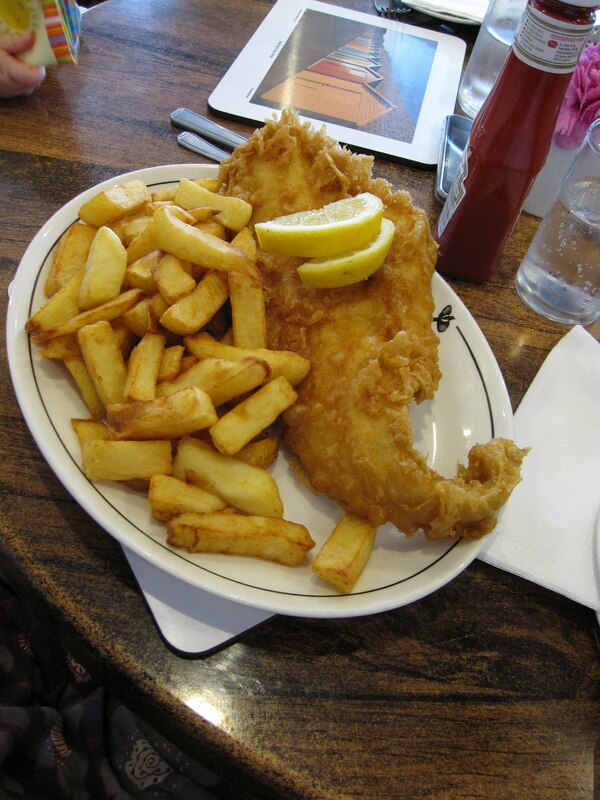 Line the base of a 20cm round and 5cm deep tine with greaseproof paper, then grease and flour the tin. 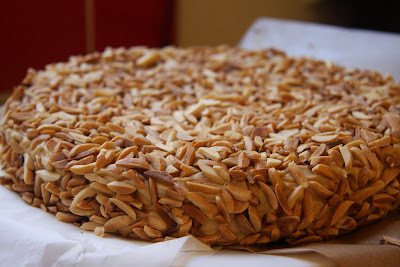 Mix the breadcrumbs with the sugar, almonds and baking powder. Whisk the oil with the eggs, then pour into the dry ingredients and then mix well. Add the orange and lemon zest. Pour the mixture into the tin, place in a cold oven and turn on the heat to 180C. Bake for 45 minutes to 1 hour or until the cake is golden brown (mine took 45 minutes). 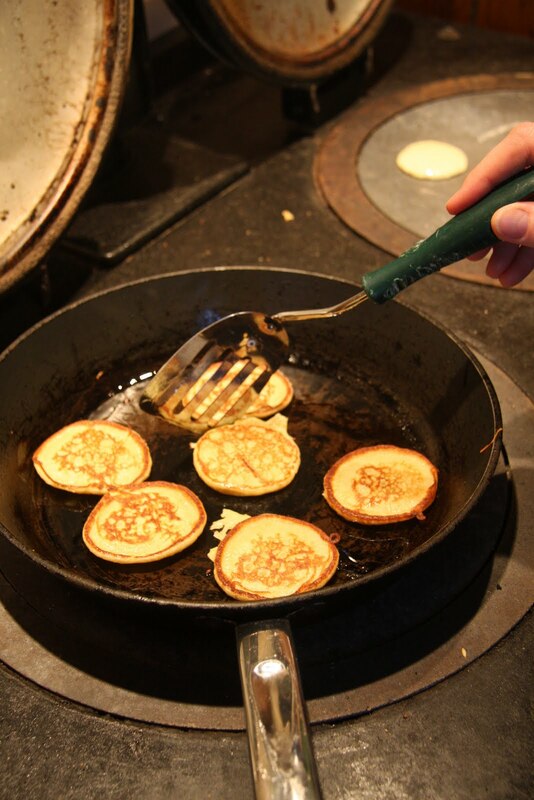 Check with a skewer by inserting it into the middle, if it comes out clean it’s done. Cool for 5 minutes before turning out onto a plate. Meanwhile, make the citrus syrup. Put all the ingredients into a saucepan and bring gently to the boil, stirring until the sugar has completely dissolved. Simmer for 3 minutes. Remove the cinnamon stick and cloves from the syrup. While the cake is still warm, pierce it several times with a skewer, then spoon the hot syrup over the cake allowing it to run into the holes. Leave to cool. Spoon any excess syrup over the cake every now and then until it is all soaked up. To make the icing, sift the icing sugar into the orange juice and zest and stir until smooth. Drizzle across the cake. 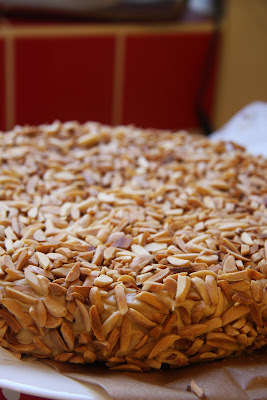 The second cake I made yesterday during my week of baking was this Coffee & Almond Cake. It's based on Mary Berry's recipe for a Gateau Moka aux Amandes which is in her Ultimate Cake Book. It's a fantastic book with recipes for pretty much every sort of cake you might want to bake - along with the Readers Digest Cookery Year, it was one of my best charity shop purchases! I followed the original recipe for the sponge, but made an all butter coffee butter cream and used a double shot of espresso instead of coffee essence. It's a simple, yet stunning, cake to make and perfect for afternoon tea and cakes in the sunshine! Pre-heat the oven to 190C. Grease and line a 9" round cake tin. Whisk the eggs and sugar together with an electric whisk until pale and thick. The mixture should be thick enough to leave a trail. Gently fold in the sifted flour. Bake for 20-25 minutes until the sponge is golden and cooked through. Leave to cool, then turn out of the tin and leave to cool completely on a wire rack. To make the butter cream, start by making a double espresso and leave to cool. If you don't have a coffee machine you could make a small amount of strong coffee in a cafetiere or use 2 tbsp coffee essence as Mary Berry does in her recipe, but I haven't tried the essence so can't vouch for it! Put the butter and sifted icing sugar in a food processor and mix until smooth. Add the cooled espresso. Once the sponge is cool carefully slice in half horizontally. Sandwich the two halves together with a little of the coffee butter cream. Then use the remaining butter cream to coat the top and sides of the cake. Finally, gently scatter the toasted almonds all over the top and sides of the cake. 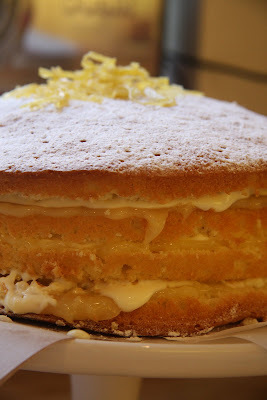 I'm having a bit of a baking week this week and what a lovely cake to start with on such a gloriously sunny morning! 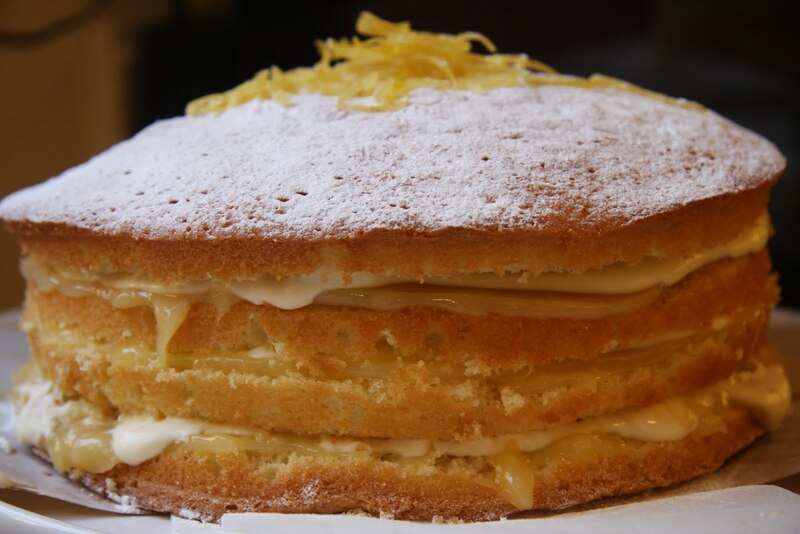 Light lemony sponge, layered with lashings of lemon curd and creme fraiche, topped off with candied lemon zest. Perfect for Easter. The recipe is based on a photograph I cut out of a magazine, probably a few years ago now, which I found stuffed in an old file of cuttings. I couldn't find a cutting of the method, only part the ingredients, so here is my version. Start by making the candied lemon zest the day before. To do this, prepare long strips of lemon zest, either using a zester or by peeling strips of zest with a potato peeler and slicing finely. Take care not to peel off the white pith as this will make the candied zest taste bitter. Place in a pan, cover with water and simmer for around 10 minutes. Drain the zest. Add the measured water and sugar to the pan and heat gently until the sugar dissolves. Add the zest and simmer gently for 10-15 minutes until the liquid has become syrupy. Remove the zest carefully and place on a non stick baking sheet. Leave to dry out for 24 hours. Preheat the oven at 180 C. Grease and line the bases of two 8" sandwich tins. Beat the sugar and butter together then stir in the eggs, lemon zest and juice. Sift the flour and baking powder over the cake mixture and stir gently until combined. Divide the mixture between the tins and bake for 20-25 minutes until golden. If you test the middle of the cake with a cake tester or scewer it should come out clean. Leave to cool before removing from the tins and placing on a wire cooling tray. Once cool, slice in half so that you have 4 layers of sponge. Stir a little of your lemon curd into the creme fraiche. Then layer up the cake starting with a layer of sponge topped with 1/3 of the lemon curd, then 1/3 creme fraiche mixture. Repeat twice and then place the final layer of sponge on top. 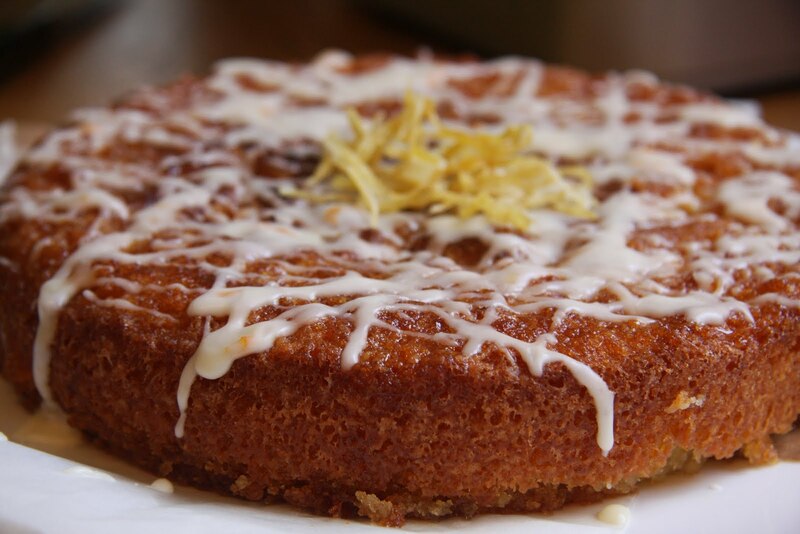 Dust with icing sugar and decorate with candied lemon zest.